For those urgent consignments required at their destinations on the same day as collection. Please Note: This service is subject to the consignment being ready after 11:00 am but before 15:00 pm and delivery being effect within 90 minutes after collection. For those extremely urgent consignments required at their destination on the same day as their collection. Note this applies to major centres only. Should this service be required outside a main centre prior consultation with The Courier Guy office is very important. Please Note: This service is subject to availability of commercial airline flights. For those extremely late urgent consignments required at their destinations on the same day as collected. Please Note: This service is subject to the consignment being ready at 15:00 pm and delivery being effected within 90 minutes after collection. For those semi-urgent consignments required at their destination on the same day as collected. Note this applies to Johannesburg and Pretoria only. Please Note: this service is subject to the consignment being collected by 11:00 am of the same day. Your parcel must fit inside a TCG provided flyer bag and be sealed. Please Note: this service is subject to the consignment being collected by 11:00 am the same day. Your parcel must fit inside a TCG provided flyer bag and be sealed. Please Note: *If a specific time is required for the consignment to be delivered by kindly state this very clearly on the waybill under the remarks section stating the time which it must be delivered. Delivery by 11:00am the following day. Applies only to major centres i.e. Cape Town, Durban, Johannesburg, Port Elizabeth, and Pretoria etc. Please Note: *If a specific time is required for the consignment to be delivered by kindly state this very clearly on the waybill under the remarks section stating the time which it must be delivered. Applies mainly to those consignments which are heavy or bulky and which are not urgently required the next morning. Delivery is normally within 24 to 36 hours. Deliveries to regional centres will take approximately 48 to 96 hours depending on the situation. Kindly liaise with The Courier Guy office before sending your consignment away. Applies to all those consignments which are not time sensitive and which may be too large to send express / airfreight. The average transit times vary from a 36 hour service (Durban, Bloemfontein) to 120 hours. Applies to advertising promotion, high tech mobile displays and prize distribution where each is individually quoted and handled with a hands on approach through to completion. Applies to those consignment containing documents available to most destinations throughout the world, maximum weight per piece is 30 kg. 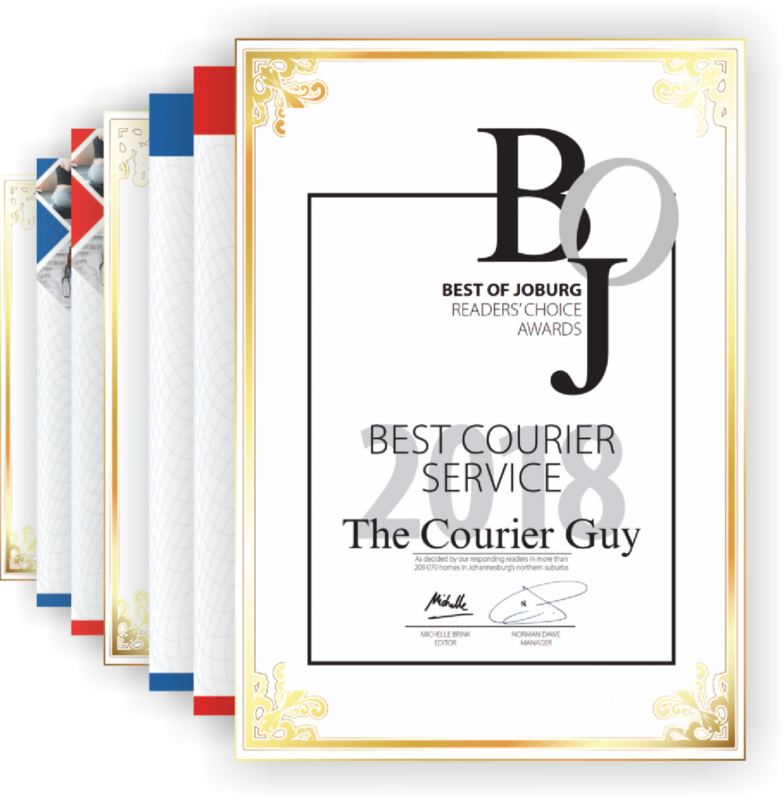 It is suggested that you liaise closely with The Courier Guy office so as to establish collection deadlines necessary in order to connect with International outbound flight from Johannesburg. Applies to the larger consignments where tariffs quoted are inclusive of all charges except duty or tax payable at custom entry points. Transit times are 48 to 96 hours more than international courier service. Consult The Courier Guy office for your queries. Should an import be required it is necessary that you contact The Courier Guy office to arrange the collection on your behalf.